Facebook CEO Mark Zuckerberg arrives to testify before a joint hearing of the Commerce and Judiciary Committees on Capitol Hill in Washington, April 10, 2018. Facebook and European Union officials were locked in high-stakes negotiations Sunday over whether founder Mark Zuckerberg will appear Tuesday before EU lawmakers to discuss the site’s impact on the privacy rights of hundreds of millions of Europeans, as well as Facebook’s impact on elections on both sides of the Atlantic and the spreading of fake news. Being debated is whether the meeting would be held after EU Parliament President Antonio Tajanibe agreed to have it live-streamed on the internet and not held behind closed-doors, as previously agreed. The leaders of all eight political blocs in the parliament have insisted the format be changed. 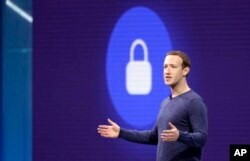 Claude Moraes, chairman of the EU parliament’s Civil Liberties, Justice and Home Affairs panel, warned Zuckerberg will have to go into greater detail than he did in his testimony before U.S. Senate and Congressional panels last month on the “issues of algorithmic targeting, and political manipulation” and on Facebook’s relationship with Cambridge Analytica. 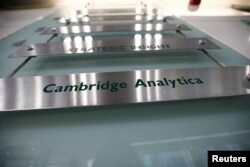 The nameplate of political consultancy, Cambridge Analytica, is seen in central London, Britain, March 21, 2018. Facebook shared with the British firm the data of millions of Americans and Europeans, which was subsequently used for election campaigning purposes. Facebook did not return calls from VOA asking about whether Zuckerberg’s meeting with EU lawmakers would still go ahead. “EU governments are absolutely aware that every election now is tainted. We want to get to the heart of this,” said Moraes. EU lawmakers say Zuckerberg’s appearance is all the more important as he has declined to appear before national European parliaments, including Britain’s House of Commons. Zuckerberg is likely also to be pressed on why Facebook is still being used by extremists to connect with each other and to recruit. Much of the focus in recent weeks on Facebook has been about general issues over its management of users’ data, but analysts are warning the social-media site is enabling a deadly form of social networking and isn’t doing enough to disrupt it. “Facebook’s data management practices have potentially served the networking purposes of terrorists,” said the Counter Extremism Project, nonprofit research group, in a statement. CEP researchers say Facebook’s “suggested friends” feature helps extremists connect to each other and is “enabling a deadly form of social networking.” “Worldwide, during the Muslim holy month of Ramadan, there has been a spike of militant activity on social media channels ... Encrypted messaging apps like Facebook-owned WhatsApp are well known mechanisms used by terrorists to communicate, plot and plan attacks, a practice that is tragically continuing,” CEP says. Aside from the EU parliament, Zuckerberg has agreed to be interviewed onstage Thursday at a major tech conference in Paris, and is scheduled to have lunch with French president Emmanuel Macron during the week. His visit comes as the British government is threatening social-media companies with a tax to pay for efforts to counter online crime. According to Britain’s Sunday Telegraph newspaper, British ministers have instructed officials to carry out research into a new “social media levy” on internet companies. Culture Minister Matt Hancock indicated Sunday the British government is beginning to move away from allowing the internet companies to regulate themselves and is ready to impose requirements on them, which if approved by parliament will make Britain the “safest place in the world” to be online. A new code of practice aimed at confronting social-media bullying and to clear the internet of intimidating or humiliating online content could be included in the legislation, say officials. Other measures being considered include rules that have to be followed by traditional broadcasters that prevent certain ads being targeted at children. Hancock said work with social-media companies to protect users had made progress, but the performance of the industry overall has been mixed, he added. Hancock said, “Digital technology is overwhelmingly a force for good across the world and we must always champion innovation and change for the better."